The Second Five-Year Plan—from January 1933 to December 1937—also gave priority to heavy industry. One of the weaknesses revealed during the First Five-Year Plan was that of the Soviet infrastructure, especially roads, railways, and canals. Consequently, the second plan also provided for reconstruction and double tracking of the principal lines, starting with the Trans-Siberian Railway. The widening of old canals and the construction of new ones (like the Moscow-Volga canal) was another vital task assigned to the new plan. By 1933 the altered international position of the USSR resulting from Hitler’s seizure of power was reflected in a rapid expansion of armament production. The armed forces were gradually reshaped into an increasingly professional, modern fighting machine, comparable to those of other great powers. Between 1933 and 1936, the size of the Red Army tripled, from 562,000 to 1.5 million, exceeding the size of the imperial army in 1913. As with the First Five-Year Plan, the second was also officially declared completed nine months ahead of time, in 1937. Again, however, not all of its goals were achieved. Among the items that surpassed their estimated targets were steel and the automotive industry, created practically from scratch. Tanks and armored cars were given priority over civilian vehicles. The most striking failure was consumer goods production. 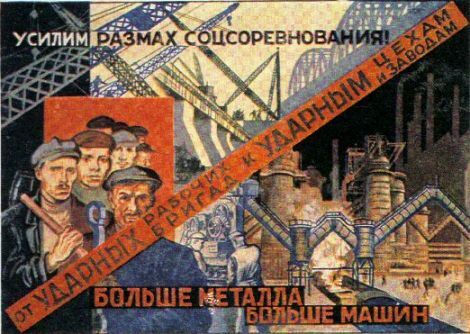 The first two five-year plans increased the industrial capacity of the USSR dramatically in all major fields—steel, coal, and electric power—and created new manufacturing sectors indispensable to any great power—automobiles, aviation, chemicals, and plastics. Consequently, the first two five-year plans laid the foundation of the industrial might of the Soviet Union, especially in the military field. Industrial expansion and often forcible relocation involved a massive shift of sometimes unwilling citizens, mostly from the countryside to the cities. Between 1926 and 1939 the overall percentage of urban dwellers nearly doubled, from 18 to 33 percent. During the first two five-year plans nearly twelve million people moved from the countryside to the cities. History had rarely seen migrations on such a scale. Most of the migrants left the countryside during the first five-year plan as a result of the collectivization and the policy of “liquidation of the kulak as a class.” The dramatic increase in the number of city dwellers represented in itself a major aspect of the Stalin revolution, leading to rapid urbanization of Soviet society.